Bill Boniface has been appointed by Governor Martin O’Malley to serve as one of the five new members to the Maryland Agricultural Commission, an advisory body comprised of representatives from different commodity groups who provide the Agriculture Secretary with information and recommendations on policies and issues facing the agriculture industry. Members serve three-year terms and are eligible to serve two consecutive terms. There are 30 members of the commission, representing poultry, dairy, livestock, nursery, horticulture, field crops, vegetable industry, veterinary, Maryland State Grange, Maryland Farm Bureau, at large ag services, agri business, turf, equine, consumers, organic farming, direct farm marketing, viticulture, agriculture education, tobacco, forestry, aquaculture, food processing, biofuels, and agri-tourism as well as the University System of Maryland. Replacing outgoing equine industry representative Ron Green, Bill Boniface is general manager of the family-owned Bonita Farm, a 400-acre Thoroughbred horse breeding and training operation in Harford County. He is a former president and a current Director Emeritus of the Maryland Horse Breeders Association. 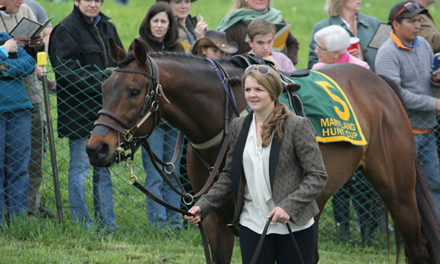 He is currently serving on the Board of Trustees of the Maryland Horse Breeders Foundation. In addition, he is the founding Director of Maryland Million Ltd. and is currently serving on the Board of Director’s Executive Committee. Boniface is also a licensed Thoroughbred owner and member of the Maryland Racing Commission’s Maryland Bred Fund Advisory Committee. Bonita Farm recently diversified part of their operation by planting 2 acres of merlot grapes. They are also working on becoming a more sustainable operation by producing their own hay.